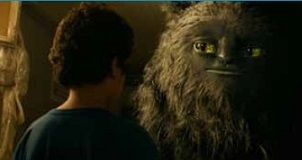 That rarest of beasts, an Israeli family-fantasy movie, Abulele is a heartfelt offering very much in the Steven Spielberg/Joe Dante mold as a lonely young boy named Adam becomes close friends with a feared monster from local folklore. Blending its earnest message with CGI effects, the movie is an ambitious entry from Israel's ever-burgeoning cinema industry and marks the feature debut of commercials director and visual effects artist Jonathan Geva. Also making his mark behind the camera is noted German/Israeli composer Frank Ilfman, who's fast establishing himself on the international film score scene and whose music here is a genuinely charming delight. Steeped in film music history from a young age (he credits his inspiration to being introduced to Neverending Story composer Klaus Doldinger whilst that score was being composed), Ilfman has so far had an eclectic career encompassing both fictional narrative and documentary, with past collaborators including the likes of Jan Hammer for 1990s Clive Owen TV series Chancer. Among his more high-profile credits are Israeli black comedy-horror Big Bad Wolves (whose percolating Gothic theme is a darkly brooding highlight) and BBC documentaries The Iraq War and Putin, Russia and the West. 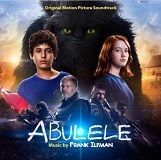 Whilst Ilfman may not be a household name to fans of more mainstream film scores, he's nevertheless amassed a noted reputation, further cemented by his status as a member of BAFTA; a score such as Abulele is surely what's needed to bring him to even wider notice. Given the richly melodic undercurrent that's surged through Ilfman's past work, not to mention the aforementioned Spielberg influences in the movie itself, it's little surprise that the Abulele score is fully orchestral and brimming with a sense of magic. Somewhat refreshingly, the opening "Prologue" track is resplendent more in the precision-tooled rhythms and intricacies of Alexandre Desplat's Harry Potter scores than the more broadly accessible stylistics of John Williams or Jerry Goldsmith (although their influence does become a factor later on), dainty strings and woodwinds establishing a charming air of magic. More dramatic, slashing strings, brass and multi-faceted percussion including bowls and chimes take over in the dramatic "First Encounter", a bold piece of action music painting Abulele as the fearsome monster than many perceive him to be. In-keeping with the movie's themes of friendship and compassion, a tender flute melody threatens to emerge from the wash of strings in "The Creature", a piece of music nevertheless still brimming with a sense of trepidation. The sense of calm doesn't last long, a brief burst of Elliot Goldenthal-esque horn trills bringing the track to a close. "A Story About a Monster" quietens things down somewhat but the predominant air is still one of mystery, albeit one contrasting light and dark as flighty woodwinds hover above the brooding string section. "No Way Out, No Way In" again continues with the Desplat influence, chimes, woodwinds and plucked strings all pirouetting around one another; the score's expert orchestration means one is never at a loss to pick out the various musical nuances, one of its greatest strengths as it glides from light to dark and back again. The lengthy "The Legend is True" then runs the full gamut of emotions from initial mystery to steadily mounting wonder; the burgeoning sense of emotion in the string section is especially well wrought in the classic fantasy soundtrack style. When the lovely main theme emerges towards the end of the cue (the very same that was teased in the opening "Prologue") in grandiose fashion, it's hard not to smile. Another extended piece, "We Are Friends", then puts the central Abulele theme through a number of instrumental variations. Beginning with some impressive horn flourishes, the track soon develops a genuinely mischievous air with its pizzicato strings and woodwinds that reinforce a suitably child-like sense of innocence. "It Will Come and Catch You" is similarly complex and well-developed as it steadily takes on more gravitas and emotion through the string section, a humanising device for which the aforementioned Williams and Goldsmith are so renowned. Once again, the Desplat influence is also there with the piping woodwinds and plucked strings. Gradually however the track turns darker, abrasive horn clusters, more rhythmic strings and percussion seemingly developing the human threat to Abulele himself as becomes clear from the trailer. More overtly comical mickey-mousing takes over in "Meeting Abulele" before Ilfman introduces one of the score's central ideas (rather curiously, midway through the album) in "Adam's Theme". A genuinely beautiful piece for piano and strings that carries with it both a sense of melancholy loneliness and hopefulness, it captures the facets of the movie's central character with real sensitivity. The cello solo three-quarters of the way through is especially affecting. Another action set-piece follows in "The Assault" before the majestic "We Will Hunt It Down" clocks in at a whopping 12 minutes. Building a sense of grandiose scale and emotion in the way the late James Horner did in his extended cues, the thematic development of both the main theme and the action material is especially impressive. The score's most Williams-esque facets then assert themselves in the closing stages during the duo of "Returning Home" and "End Titles", the delicate chimes and plucked strings gradually giving way to the emotional weight of the full orchestra in a way that is really quite lovely, Ilfman bringing his thematic ideas to a conclusion in the most satisfying way possible. From the beautifully florid strings of the former to the Goldsmithian horns of the latter, it's heartfelt, accomplished score writing at its best. In fact, the same sentiment could be applied to the score as a whole. Although Abulele's thematic ideas can occasionally be hard to distinguish, when it hits its stride the orchestral clarity and musical expression easily rivals that of its more famous Hollywood brethren. It very much draws on a tradition of scoring we've heard before yet, ironically enough, this is what makes Abulele so refreshing and pleasurable. Never is there a sense that the music is adding volume for the sake of it; instead, the music is deeply invested in the feelings of the film's characters. 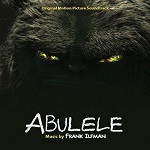 Abulele marks Frank Ilfman as a talent to watch and is a genuinely enjoyable surprise. The score album is available on CD at: Amazon.com.